Head north on Highway 101 toward Santa Rosa. Go through Santa Rosa and take the River Rd./Guerneville turnoff. Turn left and follow River Rd. through the towns of Rio Nido, Guerneville, and Monte Rio. At Monte Rio stay to the right after the stop sign. Continue on 116 west. Travel 2.5 miles to Cazadero Highway and turn right. 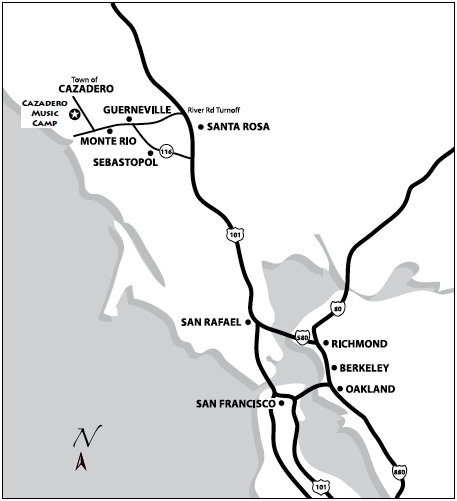 Follow Cazadero Highway for 5.5 miles. The camp is 1/2 mile BEFORE the town of Cazadero and is on the left side of the road, across the street from the Elim Grove Restaurant. Park in the lot and walk across the suspension bridge. The Cazadero Office is located in the Northbrae Community Church in North Berkeley. Coming from the Freeway (I-80 or I-580): Exit at Albany/Buchanan street and go east on Buchanan street. Buchanan Street will turn into Marin Avenue when it crosses San Pablo Avenue. Continue on Marin Avenue about another mile until you reach the signal at The Alameda. Turn left onto the Alameda. The church will be on your right between Marin and Solano Avenues. Go right at the next street which will be Los Angeles Avenue. The church is on your left, the parking lot is behind it. Mailing instructions can be found on our Contact page.